744 pages | 68 B/W Illus. 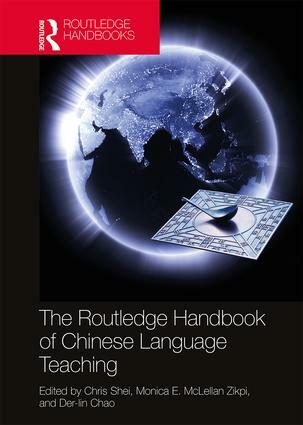 The Routledge Handbook of Chinese Language Teaching defines Chinese language teaching in a pedagogical, historical, and contemporary context. Throughout the volume, teaching methods are discussed, including the traditional China-based approach, and Western methods such as communicative teaching and the immersion program. The Handbook also presents a pedagogical model covering pronunciation, tones, characters, vocabulary, grammar, and the teaching of listening, speaking, reading, and writing. The remaining chapters explore topics of language assessment, technology enhanced instruction, teaching materials and resources, Chinese for specific purposes, classroom implementation, social contexts of language teaching and language teaching policies, and pragmatics and culture. Ideal for scholars and researches of Chinese language teaching, the Handbook will benefit educators and teacher training programs. This is the first comprehensive volume exploring the growing area of Chinese language pedagogy. Chris Shei was educated in Taiwan and studied at Cambridge and Edinburgh before the millennium. He then worked at Swansea University from 2003 until the present. He teaches and researches in linguistics and translation studies and is particularly interested in the use of computer and web resources for linguistic research, language education and translating. He is the General Editor for three Routledge book series: Routledge Studies in Chinese Discourse Analysis, Routledge Studies in Chinese Translation and Routledge Studies in Chinese Language Teaching (with Der-lin Chao). Proposals for monographs or edited pieces are received at ccshei@gmail.com on a long-term basis. Monica E McLellan Zikpi is the coordinator of the Chinese Flagship Program at the University of Oregon. She attended graduate school at the same university and completed a Ph.D. in Comparative Literature in 2014, with a dissertation on the reception history of a work attributed to the Chinese poet Qu Yuan (c. 4th-3rd century BCE). She has published research on the interpretation and translation of early Chinese poetry in Early China, Comparative Literature Studies, Journal of Oriental Studies, and Chinese Literature: Essays, Articles, Reviews. As coordinator of the Chinese Flagship Program, she is responsible for the day-to-day operations of a grant-funded undergraduate language program designed to help students beginning from any proficiency level to reach professional-level fluency in Mandarin. She enjoys helping students navigate the practical matters of learning Chinese, including finances, proficiency assessments, academic credit, and study abroad. Der-lin Chao is Professor and head of the Chinese Program at Hunter College. In 2008, she founded Hunter College’s Teaching of Chinese M.A. program. Besides teaching and presiding over the Chinese Program, she also has substantial experience acting as a principal investigator and director for federal grants which have included Department of Education’s Instructional Research Studies grant in 2001, the STARTALK grant since 2007, and the NSEP (National Security Education Program) grant since 2011. She has also made maintaining an active profile outside of her Hunter office an active priority. Dr. Chao was elected president of the Chinese Language Teachers Association, USA in 2012, and is thoroughly invested in developing extra-collegiate Chinese educational initiatives, like K-12 Chinese curriculum enhancement and development strategies with partner schools throughout the New York City area. Dr. Chao devotes herself to language program design and evaluation, technology-, web-based instructional materials, teacher education, pedagogy and assessment in proficiency-based language education, and the history of Chinese language instruction.